Your microwave should be an efficient kitchen tool. When it begins to fail, you can rely on Appliance Champion to help. You count on your microwave oven for one reason: to provide you with convenient food on those days when you don’t have enough time, energy or ingredients to make your meal from scratch. This is doubly true if you have a microwave from Thermador, one of the most relied upon brands for home appliances. So what happens when your microwave oven leaves frozen spots in the middle of your food, or only radiates to lukewarm temperatures? 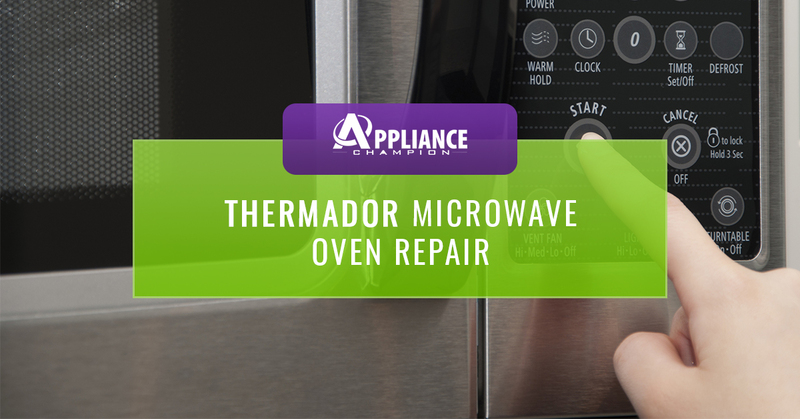 You may be tempted to run out and purchase a brand new microwave, but we can propose a better solution: local Thermador microwave repair service. Appliance Champion appliance repair professionals are your local Dallas-Fort Worth Thermador microwave repair experts, so your manufacturer’s warranty will be in tact. When it comes to Thermador microwave repair, you can count on us for quick, reliable service. Get in touch to schedule a service call today! When you need microwave repair in the Dallas-Fort Worth from a reputable appliance repair company, you can always call Appliance Champion. Why? We take what we do very seriously and strive to always deliver 5 Star Performance every time you call us. Because we only hire factory-certified techs who have been thoroughly vetted, you can count on when we show up at your front door that we know what we are doing and always have your best interest in mind. If you need microwave repair or appliance repair in the Dallas-Fort Worth area, call Appliance Champion! We provide service to Keller, Southlake, Grapevine, Colleyville, Bedford, North Richland Hills, Arlington, Fort Worth, Saginaw, and beyond. Call us today!